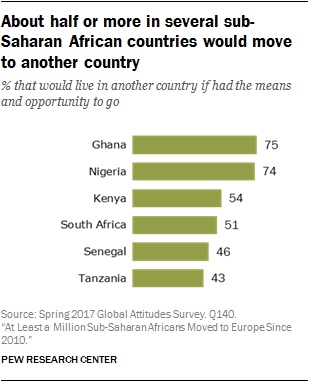 Pew: "About Half or More in Several Sub-Saharan African Countries Would Move to Another Country"
From Pew Research Center, March 21, 2018. The current population of Nigeria is about 195 million. So, 74% is about 145 million who want to migrate. The UN projects Nigeria’s population in 2100 to be 794 million. So, 74% of 794 million is, like, a lot. Shouldn’t we be having a, you know, Conversation about the Pew numbers and the UN numbers, and how they interact?